Nicole joined the Conservancy in 2013 as an Architectural Conservator. 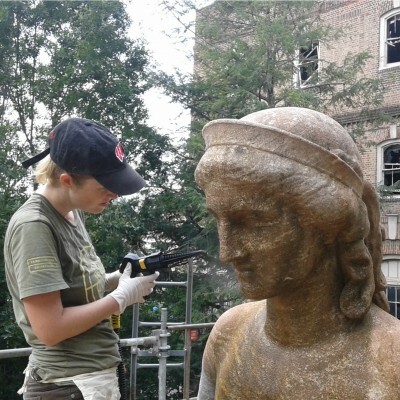 She received a Master’s degree in Historic Preservation at the University of Pennsylvania and specializes in the conservation of public art and monuments, architectural finishes, and masonry cleaning. A native of Florida and transplant from Mexico, Nicole hibernates in the winter restoring her West Philly rowhouse. Throughout the rest of the year you can find her hiking or biking Philadelphia’s trails and parks, exploring the city’s historic neighborhoods, or hanging out in her favorite park, Clark Park.